Jonn Serrie has sold more than 4 million space music albums based on his work creating special music for planetariums. This concert will feature music from his new album "The Sentinel." I will be providing a Musical Soul Portrait for the audience at the beginning of the concert. An opportunity to hear Jonn's music and experience his light show is NOT TO BE MISSED! Thurs. Oct. 19 6:00 - 9:00 pm playing piano with saxophonist Todd Wright at Casa Rustica 1348 NC-105, Boone, NC 28607. Call (828)262-5128 for reservations. Sat. 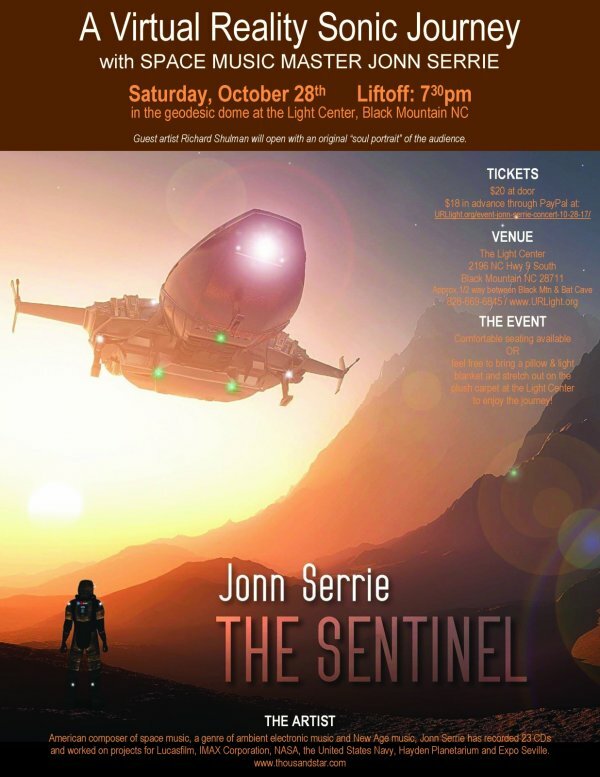 Oct. 28, 7:30 - 9:30 pm Jonn Serrie - master of Space Music concert at the United Research Light Center, 2196 NC Highway 9, Black Mountain, NC 28711 Tickets: $18 in advance $20 at door. Call 828.669.6845 or Click Here for advance tickets & info. Personifying “Practice makes perfect” is the Golden Snake, a creature partly physical but so filled with spiritual energy that it sometimes appears as an etheric and sometimes as an astral entity. The Golden Snake began its incarnational experience as the one who tempted Eve in the Garden. Since then, and through many incarnations it has learned to assist humans by awakening their Kundalini and teaching the energetic spiral movement of the return to Source. The Golden Snake resides at the Palace of Wisdom in the tower of the Three Brothers. The brothers welcomed the snake into their home after it helped the middle brother heal from a malady of judgement and criticism into an enlightened consciousness of acceptance, peace and happiness. There was a time when the snake lived in the moat of the palace in the company of the Old Fisherwoman. She would feed it fish heads and tell stories of the open sea. The Old Fisherwoman was the first human who didn’t meet the snake with condemnation and fear. Her acceptance of the snake without judgement allowed it to begin to introspect and see certain patterns of thought and behavior which were serving neither itself nor those it interacted with. The snake’s gratitude allowed it to turn its darker, manipulative attributes into more productive qualities, which helped others find their way out of judgement into equanimity and blessing as a way of life. Adjacent to the palace and connected to the moat system is a large lake on which the Old Fisherwoman still occasionally goes fishing. These days she mostly spends her time talking with travelers seeking wisdom to solve their various problems. Her cabin is built on top of a vein of gold, which she accesses whenever money is needed. None of the Three Brothers had ever married, and although they were wise in esoteric subjects, they had little experience with women or family life except for their own. Their parents had been involved with the original concept of the palace and were buried in the Founders’ Mausoleum. Before they died the told the Three Brothers that they had been born at the Cave of Birth and they asked their sons to return there to uncover information about themselves that nobody knew. For many years after their parents’ deaths the brothers never got around to revisit the Cave of Birth. In reality they were afraid of what they might find there and used various excuses to avoid their fear. The Golden Snake had seen this avoidance before with other humans and in itself and knew the cost of avoiding what one had to do. Gradually, less and less people came to the Palace, for the answers they needed were given by the Old Fisherwoman before they even arrived at the palace gate. The snake dissuaded them from harming the Old Fisherwoman and instead suggested that she may have a key for them as she once did for itself. One day they went out on the lake and spotted the Old Fisherwoman’s boat which had a bow ornament of two snakes wrapped around a pole. The brothers asked her how they could embody the wisdom they were supposed to represent at the palace. She suggested that they needed to live life beyond the palace and offered to take them to the Cave of Birth. The Cave of Birth was at the far edge of the lake from the palace and they were there in a few hours. The Old Fisherwoman led the brothers into the boat channel which opened to the cave. In the cave was a special throne on which seekers could remember their pre-birth consciousness and intentions for this life. The eldest brother, John, sat on the throne first. He saw that his life goal was to gather wisdom from all over the world and then share it. He saw that his life was totally set up to share his wisdom, but that he hadn’t experienced enough adventures and mistakes to recognize true wisdom. He determined to set off on an adventure immediately! And there was a secret which revealed itself to him which later in the full blossom of his wisdom he would take as a guiding star: No matter where anyone is in life they are adding to the wisdom of the world - learning and teaching what to do or what not to do. And in this, each one is precious, no matter what they are doing. Truth is, each will be happier applying the wisdom they have gained, but their mistakes are not really bad, simply a deeper learning. While John was on the memory throne the middle brother, James had been in conversation with a young mid-wife and the two were clearly falling head-over-heels for each other. He didn’t want to take his turn on the throne but with encouragement from his new beloved he did. He found in his session that he been slated to live a householder’s life and he immediately asked his new friend for her hand in marriage. She accepted and they dove into the cauldron of life together. The secret which they were to discover over years of experience was that love and respect for oneself and partner creates happiness, and that creates blessing for all. They didn’t always follow the advice of this secret but with the help of the Golden Snake, the Old Fisherwoman and life itself they gradually abandoned any experiments in negativity and became a shining light which many came to learn from. The youngest son Paul learned that he was to be a contemplative in this life, and the secret he was to learn was that the battles his brothers had to fight in adventuring and self development in partnership were the same battles he had to fight in his own inner self. For the purity he would strive for in his outer life was the same purity that existed in his inner being, the inner beings of his brothers, and the inner being of all the world. And they all lived happily (and sometimes unhappily, but more and more often, happily) ever after. This fable was written as part of a class taught by healer and Spiritual teacher, Ron Young.